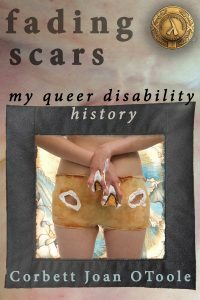 Fading Scars distills 40 years of activism in disability, queer, parenting communities. You’ve never read anything like it. Funny and engaging, Corbett pulls the curtains back on the humor and pathos of living as a disabled queer in a world that doesn’t welcome either with open arms. Corbett Joan OToole is a lovable badass writer and historian. Her take-no-prisoners insights are tempered with poignant tales of beautiful acts of kindness in an often too-harsh world. When she is not writing, she’s quilting her world onto fabric, laughing with other social outcasts and mentoring amazing disability activists. Her website has more writing as well as art.